With the help of PSD to HTML service, it is easy to develop bespoke websites, such as blogging, corporate, e-commerce, etc. Nowadays, billions of people are connected with the Internet for diverse pretexts. Therefore, to be connected with millions of users easily, deploying the websites is the finest strategy for every company. For developing the website, the PSD to HTML conversion technique fulfills the specified requirements of the websites’ functionality as well as layout. Now, if you are going to employ this conversion service from the web development company, then it will be good to have a knowledge about the significant terms that are mostly used in the conversion services. These terms will ensure the seamless communication between you and the outsourcing company as well as help you in knowing company’s strategies. Moreover, you can effectively book the project. PSD (Photoshop Document or Photoshop Design File): Photoshop is software tool by Adobe, which is used for designing the website. 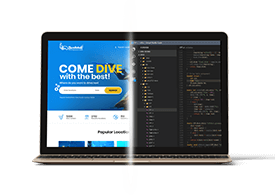 This tool works the best while converting design into the code. It is considered that the good PSD should be layered and procures organized folders in an effective manner. Design to Code: This general term states the process of converting the graphics files format into HTML(code) . Basically some significant design formats like, PSD, PNG and AI file type (Adobe Illustrator) are considered during conversion of design files. Responsive: This is defined as the feature of website layout that gets automatically scaled according to screen sizes of desktops/tablets/mobile devices. It is recommended that the widths for responsive websites should be 1024px (for desktop), 768px (for tablet), and 320px (for mobile devices). Pixel perfect: This is defined as the quality of the web design, which presents every part of the theme without having any sort of blur,. This means that the user can witness the crystal clear output. Email template: It is also called as the Email theme, which can be reused by business organization for the marketing campaign. This is basically built by converting the design into Email templates with the help of coding. WordPress: This is the most powerful as well as popular CMS ( Content Management System). It is SEO- friendly and makes it easy for the user to manage multiple URLs management as well as developing the page template. This platform comes with various plugins that enhance the functionality of the website. Adding PSD to WordPress conversion will also contribute to enhancing the online presence of a business. Bootstrap: This is a Twitter based Bootstrap platform (front-end based responsive development framework), which is the powerful tool. This framework is useful for developing application. It eases developer’s task, such as designing & coding applications in a reliable as well as consistent manner, which uses the grid based layout and is adaptable to the smartphone’s screen size. Pop-up modals: An event that is occurred in the form of popping up page or any animation that gets executed upon the completion of certain action. Slice: This is defined as the process of cutting up Photoshop design into sectional pieces that are used according to the website design by using HTML & CSS. Long page: Long Page is simply the amalgamation of two pages horizontally. The Long page is used to put a large information on the page in the form of horizontal sections. Markup: Markup is code form of the website. It generally refers as a finished form of program, which is in the form of HTML code . W3C: This is standard for website coding. The full form of W3C is World Wide Web Consortium. It is an international community, which defines the open standards and ensures the consistent as well as reliable quality for the Website. NDA : It is called as a Non-disclosure agreement. NDA is a standard legal practice. Here an agreement is signed between the hiring company as well as the hired company. According to this deal, the hired company will not make any valuable information about the hiring company public at any cost. Hopefully, now you know about every significant term that is common in PSD to HTML services. These terms will help you in terms of availing the services, but also keep you aware of the standard and policies that the company is using in developing the projects.